Next week, amid a sea of green, Georgia Southern will stand out as the Best and Brightest in the 193rd Savannah St. Patrick’s Day Parade on Friday, March 17. For the eighth consecutive year, the University will host a float decked out in school spirit and a convertible with the University president. President Jaimie Hebert, Ph.D., will ride alongside members of the Southern Pride Marching Band, Georgia Southern cheerleaders and Miss Georgia Southern University, Tori Murray. This year’s float will also feature The Dean’s List, a band comprised of Dean of the College of Business Administration Allen Amason, Ph.D., Assistant Dean of the College of Liberal Arts and Social Sciences Jason Stone, Ph.D., faculty members Krista Petrosino, Ph.D., Tim Kintzinger, Ph.D., and alumnus Zeb Mitchell. The band will perform a variety of songs from famous Irish artists. As always, the University’s bald eagle mascot Freedom will accompany the float and add some extra spirit to the event. Thor Robertson, junior accounting major, will carry on his lasting family participation in the parade by being the third generation of Robertson men to work on parade committees. 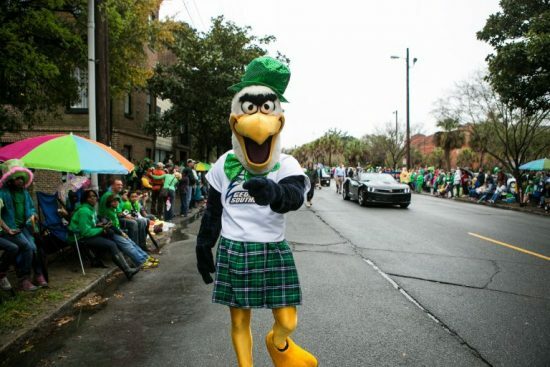 Not only does Georgia Southern have a longstanding history with the St. Patrick’s Day Parade, but it also has Irish roots that stem far past participating in the second largest national St. Patrick’s Day parade. The University Honor’s Program, along with the Center for Irish Research and Teaching, have been introducing Georgia Southern students to Irish culture through the Wexford-Savannah Axis for almost four years. Undergraduate and graduate students spend several weeks during the summer in Savannah and in Wexford County, Ireland, researching Savannah Irish descendants. Sarah Ryniker, current graduate student and one of many students who have participated in the study abroad program, has created a database of Irish families who came to live in Savannah. Through her research, she has been able to uncover lasting impacts the Irish made on Savannah after immigrating to the city in the 1800s.